For teachers to build resilient students, they need to be resilient themselves. 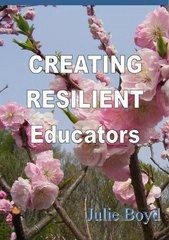 This manual is a workbook and information source for teachers who are wishing to build their own PERSONAL and PROFESSIONAL Resilience. This workbook has been written for use by middle year students. It may form a useful part of homeroom, pastoral care and health studies. ’extremely useful for teachers trying to build resiliency in students’.